Where do I use my Pizza Hut voucher code? Choose a Pizza Hut discount code from the offers page. Copy the code of your choice and follow the link through to the Pizza Hut website to start your order. Choose a pizza and any extras and click ‘Add to order’. Then click on the basket icon in the right-hand corner when you want to check-out. Here you can enter your Pizza Hut voucher code in the box provided. Click ‘Apply Code’ and continue to complete the transaction. With now over 700 Pizza Hut restaurants and delivery outlets across the UK, when that pizza craving comes a-calling you won’t have far to go to find your nearest Pizza Hut. There is nothing quite like a Fresh, Hot and tasty Pizza to enjoy on a cheat day or any day of the week. Pizza Hut has something for the whole family to enjoy from all the favourite choice of toppings including Hawaiian, bbq and pepperoni, deep pan to stuffed crust or thin crust - enjoy your pizza just the way you like it. Get creative and create your own toppings and have it delivered straight to your home or collect it from your local restaurant. Alternatively, you can head down to your local restaurant and check out the All You Can Eat Buffet. 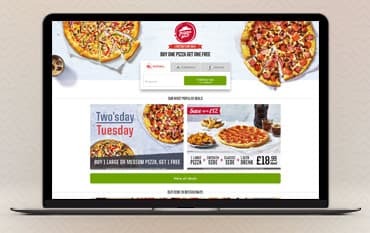 Pizza Hut is always keen on helping you save cash which is why they generously offer an array of deals including 2 for 1 on Tuesdays both in-store and for home delivery. They even offer Family Meal Deals making dining out not only tasty but more affordable for the whole family. NetVoucherCodes feature an exciting selection of money-saving Voucher Codes which would bring your costs down even more. Choose from a range of sides, drink and desserts to add to your order whether you’re eating in or ordering online, there are a wide selection yummy extras you can’t miss out on. Whether you’re treating the family to a Friday night Pizza or indulging on the weekend, there is no need to spend a fortune when eating with Pizza Hut. If delivering online or via the Pizza Hut app, don’t hesitate to check out NetVoucherCodes as you may come across a tasty little saving in the form of a code, so you can enjoy your even more scrumptious pizza for less. What better way to enjoy Hot & Fresh Pizza, baked the way you like it than delivered straight to your front door so you can indulge in the comfort of your own home. Whether you’re relaxing on the sofa or dining with a group of friends, however, you like to enjoy your Pizza Hut, head over to the website now and create your next pizza. Choose from a selection of pizza bases including deep pan or thin crusts, select from an array of delicious toppings click deliver, it’s as easy as that! Head over to NetVoucherCodes and add a discount code to your order for even more savings, or alternatively collect your pizza from your local store to save on delivery costs. If you didn’t already know, Pizza Hut has launched their very own Loyalty App which allows its users to reap in a host of tasty deals where you can earn points and rewards each time you spend over £10! As well as gaining points for your order, you can take the hassle out of eating out by locating your nearest Hut and order your takeaway straight from your device. If you fancy heading out to your local Pizza Hut restaurant, why not book a table using the app so you don’t miss out. All Pizza Huts offer a takeaway service, to check whether one near you delivers - enter your postcode or city click here. Call the customer team on 0800 028 7034 (open 08:00 – 23:00, seven days a week). As one of the nation’s favourite pizza restaurants, Pizza Hut serves up a storm across its restaurants around the world! The Pizza Hut menu features a wide array of tasty, American inspired Pizza’s which you can eat in or take away. Enjoy your favourite pizza or a tasty pasta dish as an alternative. Treat the kids to the All You Can Eat Pizza Buffet including all the favourites including Pepperoni and Ham and Pineapple! Not to forget the unlimited Mac N’ Cheese and salad bar. You can even have your pizza delivered to your home or pick up from your nearest restaurant. Try one of our Pizza Hut discount codes and enjoy some guilt-free discount pizza any day of the week.